A heartbreaking novel of the everyday life of Caitlin- a young girl with Asperger's Syndrome. Asperger's Syndrome is a rare and relatively mild autistic disorder characterised by awkwardness in social interaction, pedantry in speech, and preoccupation with very narrow interests. Not only is Caitlin socially awkward, her and her dad are grieving her brother Devon's death. The novel is in Caitlin's view and you can see how much she relied on her older brother in many everyday situations. Reading Mockingbird has made me realise how much we take for granted in life. For Caitlin so much effects how she gets through every second of every day and I find this sad. It really has made me think- just small things like making friends and being part of a group intimidates her. If she's out in the playground she's at her most frightened as the loudness gets to her. The worry makes her act really childish she finds comfort in sucking on her sleeve, which means other children find her weird. I love that even though a few children have called her names or been unkind to her, Caitlin still continues to try and make friends, she sees the kindness in everyone. Caitlin understands the importance of manners and helps enforce manners amongst her peers. I loved her friendship with Michael and the connection between them is heartbreaking especially as he is much younger than she is. I also loved it when Emma realised how good at drawing Caitlin is, it made me smile knowing that would have made her day. Caitlin may have a disorder that makes her different but she has a huge heart. The poignant story will have you hooked from the very first page through to the very last word. Seeing Caitlin improve and change her life for the better is beautiful, if you don't feel emotional whilst reading this novel then I worry about you as a person. The ending is perfect and beautiful. I also loved that Kathryn included an author note stating the reasoning behind this beautiful book. As a resident of Virginia, Kathryn Erskine was devastated by the 2007 shootings at Virginia Tech, following that tragedy, Kathryn wanted to understand the families, and the community who went through this trauma as well as the families with special-needs children and how they dealt with the life-changing events. I loved this book so much that I want to share it with the world. So, leave me a comment stating why you should win my proof copy. Sounds like this book packed a punch for you. I've been missing the emotional books lately, so this sounds perfect. Thanks for the great review! This book sound reat! I love books with medical issues and this review make me want it more! I've seen this book in the stores so much and I've been dying to read it! It sounds so good and I'm in a real contemporary kick :) I also love emotional stories, so it sounds like something I would really like!! Great review! I think that educating people about those who have special needs is very important. A few years ago, I had to tutor a young boy with both ADHD and Tourette. It took a long time for him to trust me and for me to see his heart behind his quirks, but we eventually got there. After my time with him was done, his mother took us all out for dinner. Feeling relaxed with me at last, he asked, "Teacher Enbrethiliel, did you study Special Education in uni?" I was really embarrassed to admit that I hadn't started reading up on special ed until I met him, but to his mother, it was the perfect answer. She said to her son: "See? I told you that it's not just you who had something to learn from Teacher Enbrethiliel. You taught her something valuable, too!" Ever since then, I've thought of every special needs child I've worked with as a teacher to me, too. 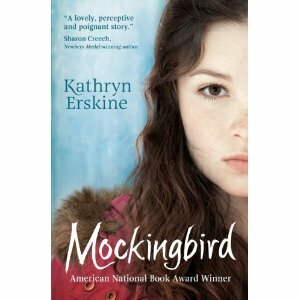 But there aren't that many of them to go around, which is why promoting books like Mockingbird is so important. I'd like to be able to do that. Well, Haley, if you like my pitch (and if I was right to take your desire "to share this book with the world" as the hint that this contest is international, LOL! ), then I hope you'll consider my entry. =) Thanks! I have a friend whose sibling has Asperger's. Reading the book would definitely help me understand what she's living with.